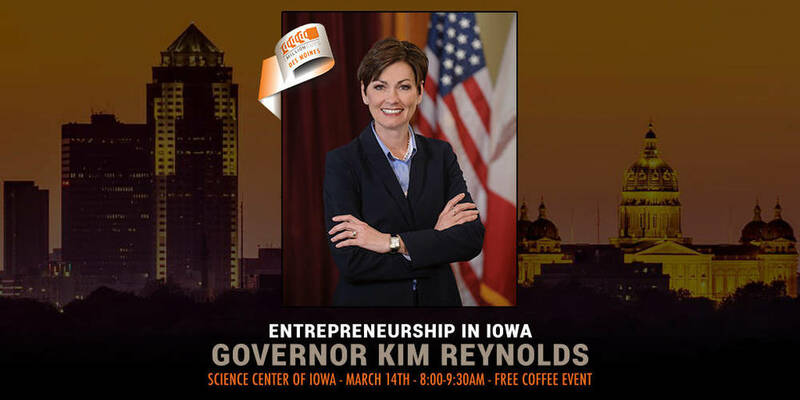 Join us as welcome Governor Kim Reynolds to a lead a discussion on the state of entrepreneurship in Iowa. Governor Reynolds will share a brief presentation, then she'll address hot topics over a fireside chat with Ben McDougal. Do you have a question or topic idea for the fireside chat? We're taking community questions up until the event. To submit your questions or topic ideas, please share them on our Facebook event page or tag @1MillionCupsDSM and include #1MCDSM on Twitter or Instagram. We expect to hit max capacity, so arrive early to make sure you get coffee and a seat. Like every Wednesday. free coffee, energized networking and entrepreneurial energy is proudly provided by your team of 1MC organizers and our family of community sponsors. See you soon!